Kim Allen Stricker (Midwest Kim), who debuted on Airplanes and Rockets with a story about his Jetco Shark 15 control line model, is now working on a Winder control line model. Both models were built from short kits obtained from Lazer Works. Lazer Works is one of a couple companies that provides short kits for hundreds of models for very reasonable prices. 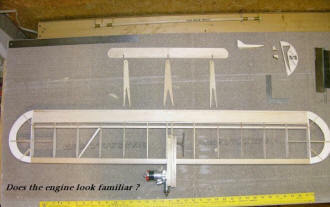 Most of the models have appeared in magazines like Flying Models, Model Builder, RF Modeler, etc. Kim is a real story teller, so I'll leave it to him to fill you in on the progress. Yeah, if you think anyone would care about a "Winder" page, I'll keep a string of photos going on it's progress. As I said with the Shark though, I just need folks to know up front that I make absolutely NO claim of any expertise. I'm waiting for some metal wedge tanks and lead-out cable from Brodak. I figure to cover the monster with orange and black Monokote, and bribe one of the line crew into throwing the thing. I don't know about the copyright situation, but can scan the rest of the article to you too. Fast Eddie apparently knows Terry Prather, and got the plans from him. At this point, once the Winder is off the table, I'm looking to start on the other combat kit from Eddie, a Midwest "Hornet". 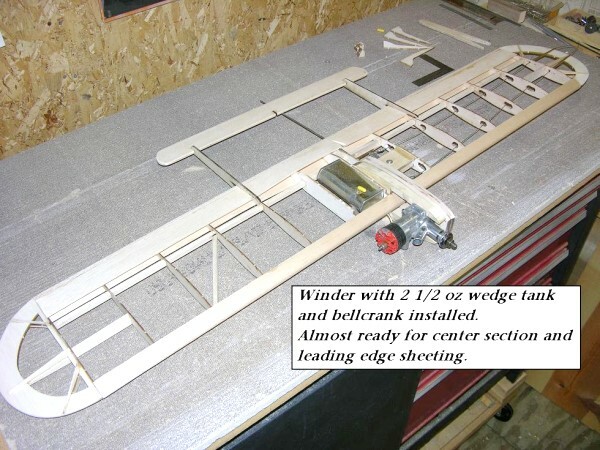 In Prather's article, he talked about the turning advantages of the Winder's narrow and thin high aspect-ratio wing verses the older, "fat and wide" winged combat planes. When I get the Hornet flying, I'll have one of each type, so we'll see if my old reflexes can tell the difference! Got the dog looking more like it's ready to run! 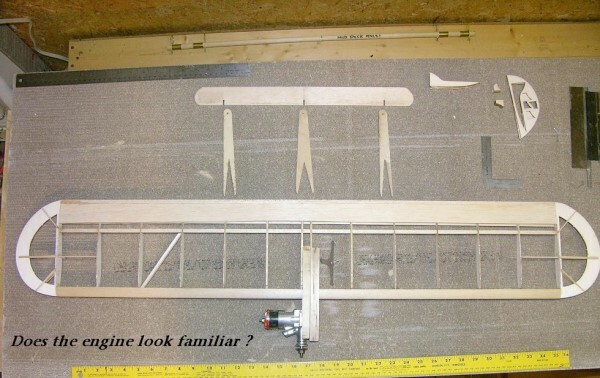 I've been working on the more tedious stuff...wanted to sleeve the booms with brass tubing for the elevator's hinge pins...and trying to see into the future so I don't miss anything again...like forgetting to fiberglass the engine mount assembly before sticking it in the wing!!!!! In my own way, I'm getting a glimpse into what this stuff was like "Back in the Day". Imagine how driven those guys were to go through all this building (times how ever many planes they needed as spares!) with slow glues and lots of carving and shaping, then to put their creations on a set of cables and try to out-maneuver, out-run, and out-cut the other guy who'd gone through the all the same stuff himself! You REALLY had to want to do this stuff, and force yourself to forget the hours in the shop as you tried to get behind your opponent, and put him in his place. I just hope I can stay with this sucker once a I con a friend into launching it! 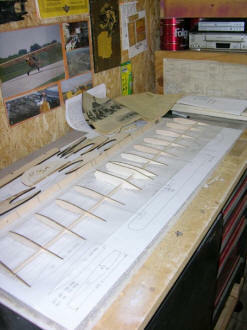 The plane is now fully assembled, with the booms and elevator epoxied in place, and the fuel-proofing finished. I chose the sunburst scheme and colors from a Bearcat painted in the colors of Al William's series of military airshow planes. 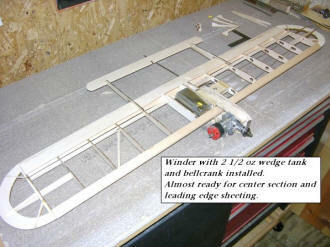 This is gonna be applied with Brodak Dope, over the Winder's silkspan covering. I know I'm gonna get holes that Monokote might have resisted, but could not turn loose of the nostalgia quotient of the old dope and paper covering method. While I was at it, I took some time to put your McCoy .35 on the test stand, and get an idea of what it's habits were before trying to fly it. After barking at me to tighten up it's prop, the old engine fired up and ran great on some fairly old 10% fuel. I didn't think to tach it, but it was a healthy, smooth run (purposely on the rich side) that used up all of it's fuel with a clean shut down at the end. Thanks for the good deal on this great little engine! Got some time to crank out a little work on the Winder Project...and have just about knocked it off. I even took it out to the airport to let fellow lineman Rory see the plane he's gonna be chucking for me. 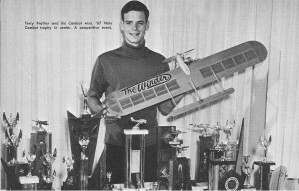 He's only seen one of my stunters fly, and commented on it's "high speed"...with me replying that the Winder will make that plane look like a Wal Mart shopping scooter! The Brodak Dope worked great, except when I got impatient and tried to pull off the masking tape a little too soon...LET THE PAINT DRY ! Anyway, it's gonna get stored in the van, along with the Shark 15, and probably test flown some calm evening down at the Cape Girardeau Airport. I'm somewhat amazed at the near-total ignorance about this great old sport. There's only one other guy at the airport that flew control line planes in his youth (and is interested in seeing these projects go forward), but just explaining the concept to everyone else has been a challenge. Once I get all of these dogs test flown and on-line (along with my reflexes), I'm gonna work with the control tower chief to let me fly a little demo on the ramp out beside our main hangar. Our tower closes at 7:00 pm, which gives me about an hour or so of flyable light in the evening, but it'd be fun to do a mid-day flight, and demonstrate the little monsters. The chronology of these resurrection photos runs from bottom to top. Winder Painted in Bearcat Racer Colors - Just Like the Drawing!